How a film series with zero production value and no fans blindly soldiers onward. Nothing says summer excitement like a good blockbuster. In 2018, audiences have already been gifted with several great films like The Incredibles 2, Marvel's Infinity War, and Deadpool 2. Of course, not all movies are created equal, and some summers can be bummers in terms of quality releases. Transformers, Sharknado, and anything from the DC Cinematic Universe come to mind when discussing franchises with lukewarm audience approval. It seems like everyone has their own love-to-hate film franchise and for me, that series is none other than The Purge. Let me take you back to the year 2013. I was a Freshman in high school, concerned with little more than school, video games, and YouTube. I'd heard of the first Purge movie, and was interested, but never watched it in theatres. The film's less-than-stellar reviews certainly didn't put me in any great hurry either. It wasn't until the release of the sequel, The Purge: Anarchy, the next year that I became legitimately curious. How could a film that had received such a "meh" response by critics and audiences possibly get a sequel less than a year later? Despite mixed reviews, the $3 million budget film made about $90 million, far surpassing its profit margins. Even I'll admit that the concept of the films is at least compelling. For those who aren't aware, The Purge franchise takes place in a dystopian America where all seems well. Crime rates are negligible, the economy is booming, and happiness is at an all-time high. The only problem? An annual event known as The Purge, where for a 12-hour period, all crime including murder is legalized. The point of the Purge is to cleanse aggression and decrease crime by sanctioning criminal activity for a short period. By all rights, the franchise should be viewed as nothing more than another dumb but entertaining summer movie, and treat itself as such. In my opinion, the main problem with the franchise is its insistence upon its central message, promoting itself as biting social commentary while delivering none of the actual bite. The first film takes place in 2022, hinting that the Purge, or something like it is not only possible but probable in the near future. By taking itself so seriously, the series gives up any goodwill it could've had by being just another dumb summer movie, instead forcing audiences to view it as a serious film, in which case it falls flat. This summer will mark the series' fourth entry, The First Purge, and I couldn't care less. I first saw the film's trailer during the previews of Deadpool 2, (a much better film) and was shocked. I understand that the franchise must surely have fans, but I've never even met anyone who's seen an entry in the series, much less enjoyed one. At the end of the day, though, who knows? Maybe I've met a few people who saw one of the films, but never asked. The Purge franchise isn't exactly a stimulating conversation topic. Despite my ambivalence toward the series, I am genuinely curious about the new film. It's supposedly a prequel to the series, so it might not hurt to give it a watch after all. Any relationship can work, but not each one will: it all depends on each partner's willingness to make it work, and what kind of relationship they cultivate. 1. You are allowed to explicitly vocalize the things you do and don't want. 2. You cultivate the culture you want within your relationship. Honesty is the best policy. It's much easier, to be honest about things than to hope your partner is a mind reader - and honestly, your partner probably isn't a mind reader so the best way to get what you want is to actually say what you want. 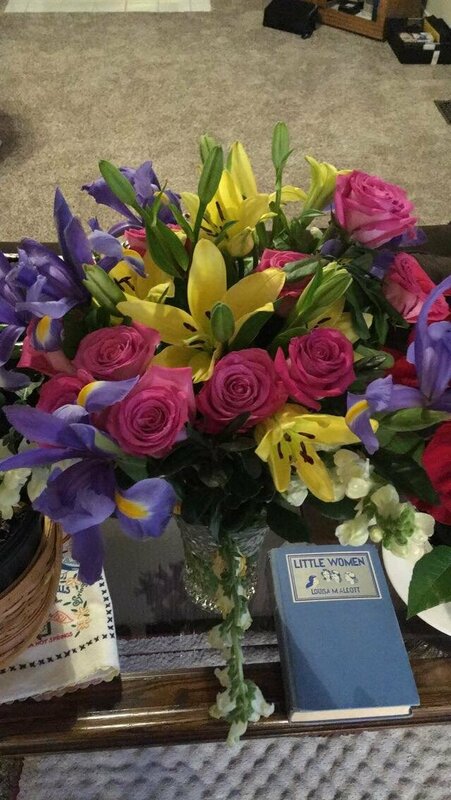 This BEAUTIFUL mixed bouquet showed up on my doorstep and I came home from work to a surprise that filled my heart with love! I know there's this ridiculous stigma that saying what you want sounds greedy, but being greedy makes you sound greedy - saying what you want makes you sound direct and honest. 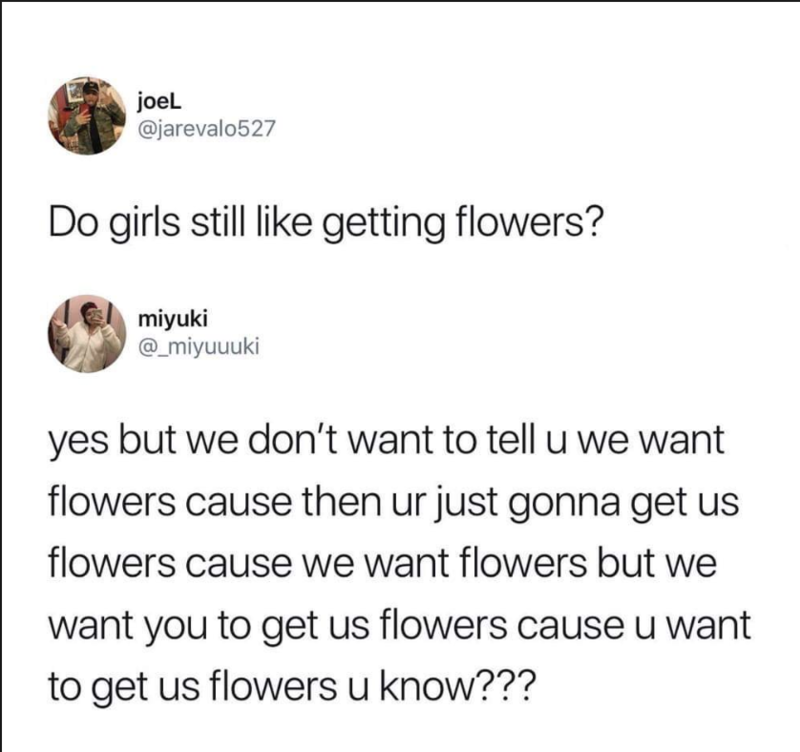 My boyfriend thanked me for telling him because he said he had wondered if I would like to receive flowers and I took the wonder out of it by giving him an answer to a question he didn't even ask. So what's the point of this story? Well, first of all - it's an example of me explicitly asking for what I wanted. Second, it is yet another tactic in my effort to cultivate a culture of honesty and open communication within my relationship. If I'm not vocal about what I do and don't want, who's to say my boyfriend would be vocal about what he does and doesn't want? It's pretty much the same as "treat others you want to be treated," - act the way you want your partner to act because if you display the behavior you want to see, your partner will know it is acceptable and therefore (most likely) feel more comfortable acting that way. Say what you don't want. And, if all goes well, your relationship will be defined by honesty and open communication.